Say you're a small business owner and you need to run a credit card. We've got an app for that. Now say you need to print a shipping label. We've got an app for that. Now say you want to make sure it got there. We've got an app for that, too. Yeah. It's called the web. Look, you can run your customer's credit card through any number of payment portals through a simple web page, through a LOT of browsers installed on a LOT of phones. You can pull up printable labels, but if you're on a phone you have to switch to a local wifi connection to print it and how often do you do that? Finally, FedEx has had lots of ways to track packages remotely since pagers. Yeah, I said "pagers" as in "the iPhone is as good as a crack dealer's pager." I know I rant on Apple, but I think what I really rant about is the fact that they're taking credit for a whole lot of stuff that already exists. I can do all that they talk about in that ad on my Windows Mobile phone. But, more importantly, I could do most of what they're talking about in 1997 on my Palm Pilot. It's not new, it's just packaged well. Let's not even go into the absurdity of printing a shipping label from your phone. 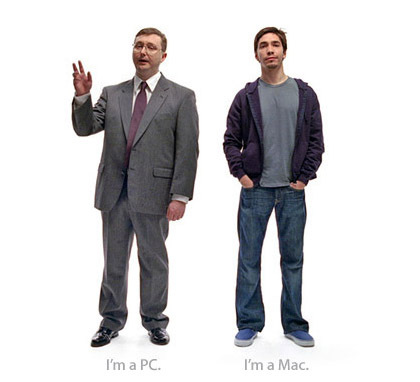 Instead, let's consider the exclusivity Apple is breeding with their campaign. Their advertising implies the ONLY mobile computing is on the iPhone. It's an us and them mentality that stifles true innovation and the sharing of information, and if you want to be honest about it, it's a campaign that fosters bigotry. If you think the word "bigotry" is too strong, think about the "I'm a Mac, you're a pathetic idiot" campaign. Am I overreacting? Maybe. But let's really think different for a moment. If your company is built on the concept that you're cooler than everyone else, why do you have to take petty shots at people who work for a living ("I'm a PC, I have poor fashion sense and work hard" "I'm a Mac; I'm a slacker who can't even dress himself")? Why do you pretend that you're the only one on the block who thought about accessing FedEx through a cell phone? Apple is not the counter culture revolution. Apple IS the man. Just a Man who dresses casually, but also a man who hasn't got a creative bone in his body. It's about time APPLE gets taken down a few notches, along with their fanboys and fangirls. While we all know that Microsoft is far from perfect, many Microsoft dollars, via Bill Gates, flow out to make huge improvements around the globe. Apple has massive cash reserves. So, who's really cooler? Those hording cash or those using it to make the world slightly less sad? iPhone? It's a mobile phone, big deal. A mobile App is a web site you pay for. How cool is that? You have to hand it to Jobs & Co. They can sell salt water to a sailor and make him pay for the shipping. I've had 3 or 4 iPods, but I'll probably keep buying them not because they're a superior product, but because Apple has sold me on the idea that they're awesome and I can't enjoy life without one. Sad, I know.